The roadster had never before received such high recognition. Worlds Fair exhibitors had the opportunity to compete for over $15,000 in prizes. Pair Mares or Geldings (Trotters)-Four years old or over, to road wagon: Sometimes and Always; Exhibitor B. R. Middleton, Mexico, Mo. Single Mare or Gelding Trotter-Three years old and under four, to road wagon or buggy: Wilkie Walnut; Exhibitor J. G. Callison, Windsor, Mo. Pacer, Mare or Gelding-Three years old or over, to road wagon: Blondie; Exhibitor J. G. Callison, Windsor, Mo. "Sometimes" and "Always" were a matched pair of chestnuts that easily won their class. They were driven in the show by Ben Middleton and owned by Alex. Bradford of Columbia, MO. Mr. Bradford explained the names of the horses. "Always" received his name because in individual classes, he always won. The other one won "Sometimes". Mr. Bradford told that he trained his own horses and when he had trained a horse to perfection, he generally sold it. 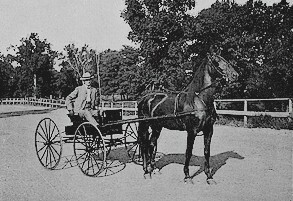 Mr. Bradford, himself, drove a few of his own horses in competition at the World's Fair. One of his favorites was "Scotch Highball." Pair Mares or Geldings (Trotters)-Four years old or over, to road wagon: Royal and Harry; Exhibitor Thomas Wilson, Pleasant Plains, Ill. 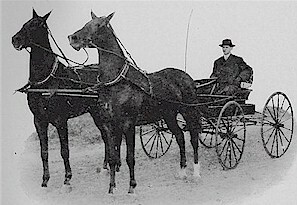 Pair Mares or Geldings (Trotters)-Three years old and under four, to road wagon: Isabel and Claribel; Exhibitor Thomas Wilson, Pleasant Plains, Ill. Single Mare or Gelding (Trotter)-Four years old or over, to wagon or buggy: Harry M.; Exhibitor Arch Mains, Virginia, Ill. Single Mare or Gelding (Trotter)-Three years old and under four, to road wagon or buggy: Claribel; Exhibitor Thomas Wilson, Pleasant Plains, Ill.
Pacer, Mare or Gelding-Three years old or over, to road wagon: Annie May; Exhibitor Wm. H. Sturgis, St. Louis. Reference: Farmer Stockman, September, 1904.